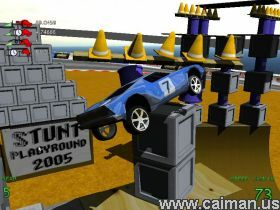 Caiman free games: Stunt Playground by Walaber. Stunt Playground is a unique and fun game. you must drive a car around a race course setting and earn you score by doing stunts. You must make jumps for distance and height, spins, flips etc there are 4 vehicles to choose from and each handle differently. The best thing about this game is the editor. Make your own stunt park and place jumps and other obstacles around the arena and do your own crazy stunts, save your stunt playground and then share your arena and challenge your friends. It even has an instant replay feature with full VCR controls to save and load replays and future addons to the game. 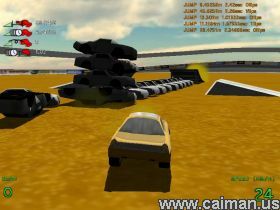 An interesting and addictive car game with a good 3D engine, believable physics system and some nice sounds and effects. 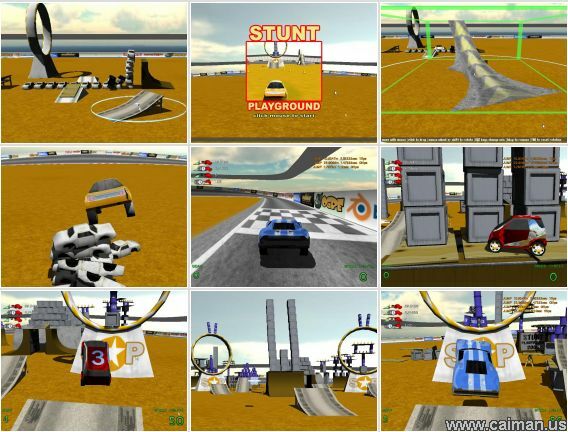 If your tied of the usual car race games then check Stunt Playground out. 4. 3D accelerator video card. 5. DirectX 7.0 or above, or OpenGL. fan site, extra arena downloads, forum .